Payday 3 is on the way but that doesn't mean Payday 2 is stopping any time soon. 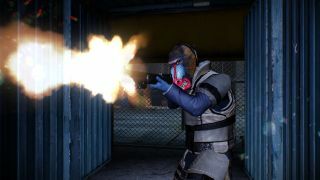 Along with announcing that it had re-acquired all the rights to the first-person heist series from 505 Games, publisher Starbreeze revealed that it plans to support Payday 2 through at least the end of 2017. On top of new stuff, developer Overkill also plans to strip out some of Payday 2's less-popular microtransactions. Hand grenades will be available for all players instead of being locked behind paid DLC, and all those loot-bearing, tradeable safes will be free to open. Starbreeze and Overkill didn't reveal any details about Payday 3 beyond its existence, but it will be welcome news for fans of wearing masks and doing crimes. Given the update commitment for Payday 2, I wouldn't expect it to arrive until mid-2017 at the earliest. Speaking of which, here's a live-action tease for some upcoming Payday 2 news at E3. The crew are talking about working with a biker, which makes me wonder if The Walking Dead's Negan is coming to claim his trademark baseball bat. Lucille was previously added to Payday 2 to commemorate the announcement of Overkill's The Walking Dead so we'll have to wait and see if the pre-apocalyptic crossover gets any deeper. Keanu Reeve's John Wick is already a playable character, so clearly anything is possible here.